Where do I use my Rodial voucher code? Following her years as an international journalist, passionate beauty enthusiast, Maria Hatzistefanis founded Rodial back in 1999. After recognising a gap in the market for high-performance skincare solutions for women, Maria began offering result-driven treatments. Her innovative and unique brand soon began gaining the likes of celebrity names and now has a global reach with a presence in 35 countries worldwide. Combining groundbreaking innovation with anti-ageing ingredients, Rodial is proud manufacturers of high-performance skin essentials which address a wide range of skin concerns. Rodial products utilise a unique and powerful blend of ingredients including bee venom and dragons blood which is designed to create effective and immediate results. It’s the unique formulations created by Rodial which their customers love and trust. What’s more, with years of working alongside celebrity makeup artists, Maria found the opportunity to make Rodial the next best thing and created the ultimate sculpting makeup collection designed to enhance natural beauty for flawless results. Shop the ultimate Skincare collection with Rodial boasting targeted solutions with independent results and long-lasting benefits. Uncover world-class anti-aging ingredients with innovative and unique formulations to create the high-performance skincare essentials you know and love. Shop everything from hydrating moisturisers and cleansers, oils, eye patches and so much more and be a part of this groundbreaking, original brand that’s creating new boundaries in the world of skincare. Using out Rodial Deals Page right here at NetVoucherCodes, you can grab all the things you love for much less so see what we can do for you today and fill your dressing table with Rodial Skincare Essentials. No Rodial do not test any of their products on animals. Most products, with only very few exceptions are actually Vegan friendly too. Are Rodial products safe to use while I am preganant? Although there are no ingredients in any of the products that should be avoided during pregnancy, Rodial advise that you should always seek advice before introducing a new active body care product into your regime. Are there any products that are for sensitive skin? Yes, the Dragon's Bllod range is ideal, because of their gentle formulas that are kind to sensitive skin. 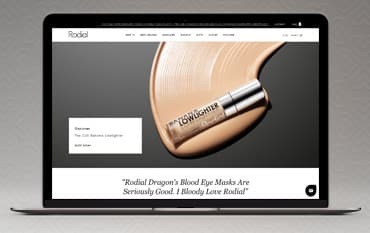 Established almost two decades ago, Rodial has become one of the most popular health and beauty brands within the industry and boasts a huge celebrity following. Shopping with one of our Rodial Voucher Codes can ensure you make great savings online and enjoy all the innovative, unique and natural beauty products Rodial has to offer for much less. Fusing science and nature to effective skincare products, Rodial offers a huge array of skincare, body care, weight loss, cosmetics and so much more which will perfectly complement your skincare routine.